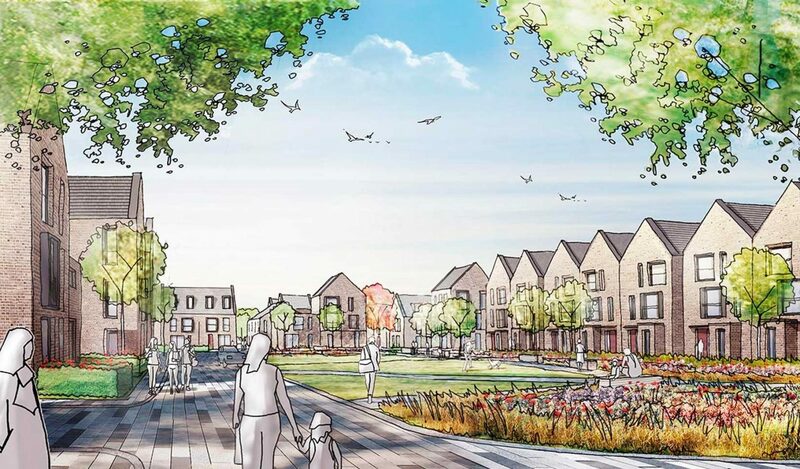 A planning application has been submitted by CALA Homes for 222 new homes (including affordable housing), landscaping and amenity space on the first development parcel at Wintringham, which forms part of the Eastern Gateway to St Neots. The proposal is for 184 houses (2, 3 and 4 bed) and 38 flats (1 and 2 bed) on land south of Cambridge Road, to the east of St Neots. The application is the first detailed plans for homes within Urban&Civic’s development and reflect the high quality design and layout agreed in the development’s Design Code. In keeping with the vision for the development, the landscaping will create an attractive setting both for new residents and surrounding neighbours: ensuring green corridors to connect people to two new parks and play areas, with significant new tree planting, hedges and shrub beds as well as wildflower planting. The landscape will link to the larger green spaces being delivered as part of the overall development by Urban&Civic including the significant works along Cambridge Road and the refurbishment of the brooks that cross the site to deliver both benefits for nature and people. CALA has worked closely with the Urban&Civic design team to propose not just well designed homes, but functional facilities like secure and covered bike parking for each home and resident and visitor car parking. The proposed layout includes breathing space for residents to meet up, and areas for community initiatives such as vegetable/fruit gardening areas, and doorstep play and exercise for all ages. Master developer, Urban&Civic was granted outline planning permission for Wintringham in November 2018 and site preparation and early works began at the end of last year to take forward the development, which will deliver 2,800 homes, two primary schools, community facilities including a health centre and business space for R&D, creative space, offices and industrial units. Huntingdonshire District Council is consulting on CALA Homes’ planning application until 23 January 2019.